Velebit is the longest (145 km), though not the highest mountain range in Croatia. Among Croatian mountains, it takes fourth place according to altitude. It is lower than the mountains in Zagora – Dinara (1831 m ), Kamešnica (1809 m ) and Biokovo (1762 ). Velebit mountain range is 10-30 km wide, having surface area of about 2200 km2. Its highest peak is the Vaganski vrh at 1757 m. The range forms part of the Dinaric Alps. It stretches along the Velebit Channel, part of the Adriatic coast, from Vratnik above Senj in the northwest to Canyon of River Zrmanja in the southeast. On the landside Gacka, Lika and Gračac field with rivers Gacka, Lika and Otuča surround Velebit. • Northern Velebit, between mountain passes Vratnik and Veliki Alan above coastal village Jablanac. Length of northern Velebit is about 30 km and a maximum width 30 km. • Central Velebit ends at mountain pass Baške Oštarije over which the road Karlobag – Gospić passes. Length is about 24 km and the maximum width 20 km. • Southern Velebit, ending in Mali Alan, on the old road that connects Obrovac and Lovinac. Length is about 46 km and a minimum width of about 10 km. • Southeast Velebit begins at the same pass and ends by the canyon of river Zrmanja. It is long is about 40 km. This division is based on geographical, morphological, relief and biological characteristics of Velebit regions. Division line follows the passes along which the roads connect the interior with the coast. The whole area of the Velebit mountain is protected as a nature park, from which two national parks have been carved out: Paklenica and Sjeverni Velebit. 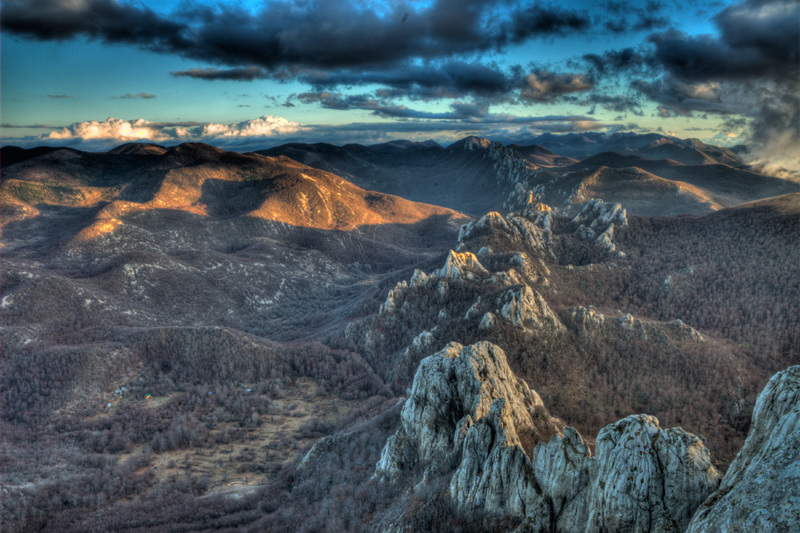 Within Northern Velebit special reservation Hajdučki and Rožanski Kukovi are under highest nature protection. The best-known protected plant species, endemic Degenia velebitica from the mustard family, is shown on the reverse of the coin of 50 lipa (first described and classified by botanist Arpad Degen and is named after him). Velebit has the largest and deepest speleological objects in Croatia. The three-part “Lukina jama” cave is 1392 m deep (from the height of 1,436 m to a depth of 81 m), while the “Slovačka jama” is 1320 m deep. For hikers, many marked trails and roads are arranged on Velebit, longitudinally and transversely connecting surrounding villages and mountain huts. Due its uniqueness, orderliness and attendance it is necessary to mention Premužićeva staza (Premužić’s pathway), which was built between the two world wars. It connects mountain lodge Zavižan over the Veliki Alan pass with Oštarijska vrata, leading transversely through the northern and middle parts of Velebit. The mountain represents a significant barrier to communication between northern and southern Croatia. Besides Vratnik (698 m ), the most important passes through which roads are built are: Oštarijska vrata ( 928 m ) between Gospić and Karlobag and Prezid ( 766 m ) between Gračac and Obrovac. Highway A1 road link through Velebit was built in 2003. with the opening of Sveti Rok tunnel Along the coast at the foot of the Velebit, runs Adriatic magistrala road that is known for its large number of turns and frequent closure due to the bura wind during the winter.